Bronchiolitis is an acute viral infection of the small air passages of the lungs called the bronchioles. Bronchiolitis is extremely common. It occurs most often in children between the ages of two and 24 months, with peak infection occurring between three and six months of age. About 25% of infants have bronchiolitis during their first year, and 95% have had the disease by their second birthday. In temperate climates, bronchiolitis peaks from winter to late spring. In subtropical climates, the disease peaks from October to February. Children who attend daycare or who live in crowded conditions and those who are exposed to second-hand smoke at home are more likely to develop bronchiolitis. Premature infants and children born with heart and lung defects or HIV/AIDS are more likely to have severe, life-threatening infections. Bronchiolitis occurs more often in boys than girls, with boys being hospitalized at 1.5 times the rate of girls. Bronchiolitis is a significant cause of respiratory disease worldwide. The World Health Organization (WHO) has funded research to develop a vaccine against the disease, but thus attempts have been unsuccessful. Bronchiolitis is caused by several different viruses. The most common of these is respiratory syncytial virus (RVS), which is responsible for about 100,000 hospitalizations of children under age four each year. Two subtypes of RSV have been identified, one of which causes most of the severe bronchiolitis infections. In addition, bronchiolitis can be caused by influenza, parainfluenza, and adenoviruses, all of which are common from fall through spring. These viruses are spread in tiny drops of fluid from an infected person's nose and mouth through direct contact, such as shaking hands, or kissing. The viruses can also live several hours on countertops, toys, or used tissues and easily infect people who handle contaminated items. The time from infection to the appearance of symptoms varies from two to seven days. Bronchiole — A thin air passage in the lung that branches off a larger airway. Congenital — A condition that an individual is born with. Bronchiolitis affects individuals differently depending on their age. In adults, older children, and some infants, bronchiolitis viruses causes symptoms similar to a mild cold—runny nose, stuffy head, and mild cough. The lungs are not involved, and these symptoms clear up without any medical treatment. In some children under age two, the cold-like upper respiratory symptoms worsen after a day or two. The lung tissue begins to swell and produce mucus, and the cells lining the bronchioles begin to slough off into the air passages. As the airways narrow from swelling, and mucus accumulation, breathing becomes difficult, and the child makes a wheezing or whistling sound with each breath. Lung involvement can occur quite rapidly. The most common signs of bronchiolitis involve the infant's struggle to breathe. The child may take 50-60 breaths per minute and may develop brief periods when they stop breathing (apnea) and begin to turn blue (cyanosis). This occurs most often in babies who were born very prematurely or who are under six weeks of age and babies with congenital heart and lung problems and compromised immune systems. Babies may also stop eating, because it is becomes difficult for them to swallow and breathe at the same time. They may have a low fever, cough, and vomiting. Bronchiolitis is usually diagnosed through a physical examination by a pediatrician or family physician. The physician often finds an increased heart rate, rapid, labored breathing, and crackles in the lungs when the child inhales. Signs of ear infection (otitis media) and throat infection (pharyngitis) are sometimes present. Although laboratory tests are available that can within in a few hours confirm the presence of RSV, these tests are not routinely necessary. The oxygen level in the blood may be measured through pulse oximetry in babies who are having difficulty breathing. Inadequate oxygen in the blood is an indication that hospitalization is necessary. Chest x-rays may be done on severely ill children to rule out other conditions. The degree of respiratory distress determines treatment. Individuals with mild symptoms are treated as if they have a cold with rest, fluids, and a cool air humidifier. Babies who are struggling to breath may hospitalized and given supplemental humidified oxygen. Their breathing will be monitored and if necessary fluids will be given intravenously to prevent dehydration. 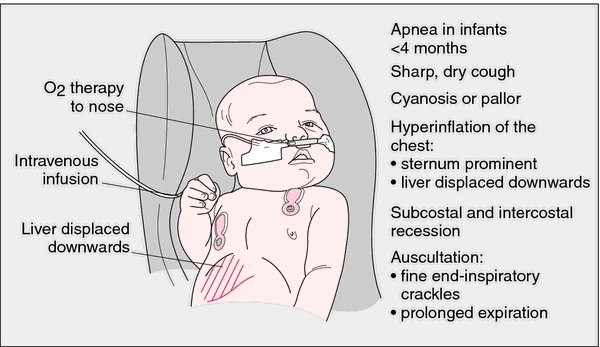 Occasionally infants need mechanical ventilation to fill and empty the lungs until the airways open. Those children with compromised immune systems from diseases such as congenital HIV/AIDS and transplant patients are at highest risk for severe infections, serious complications, and death. Children with congenital heart and lung disorders are also at higher risk, as are infants under six weeks old. These high risk children may be admitted to pediatric intensive care units and treated with ribvarin (Virazole), a drug that keeps the virus from reproducing. This drug is reserved for the most critical cases. Although there are alternative treatments for cold symptoms, such as echinacea and zinc, parents should consult their health practitioner about the appropriateness of using these treatments in very young children. The majority of children who get bronchiolitis, even severe infections, recover without complications in one to two weeks, although fatigue and a light cough may linger longer. About 60% of people develop only cold-like symptoms without lung involvement. However, the disease accounts for about 100,000 pediatric hospitalizations and 4,500 deaths each year. Deaths usually occur because medical care is not sought soon enough. Although many viral illnesses, like chicken pox, can be contracted only once, after which individuals develop immunity, people can get bronchiolitis multiple times. However, after the first infection, the symptoms are usually mild. The viruses that cause bronchiolitis spread very easily, making prevention difficult. Common sense measures such as frequent hand washing and keeping children away from crowds and sick individuals are only partially effective. Certain very high risk babies can be treated during the peak virus season with monthly injections of antiviral immunoglobulins to protect against RSV infection. These injections cost several thousand dollars per child per season and are reserved for children whose life could be at risk if they became infected. Antiviral immunoglobulins are used only for prevention and are not effective as a treatment once the infection has been acquired. "Bronchitis." Medline Plus Medical Encyclopedia 19 January 2005 [cited 16 February 2005]. http://www.nlm.nih.gov/medlineplus/ency/article/000975.htm. DeNicola, Lucian K. and Michael Gayle. Bronchiolitis, 17 July 2003 [cited 16 February 2005]. http://www.emedicine.com/ped/topic287.htm. Kirlov, Leonard R. Respiratory Syncytial Virus Infection, 24 November 2004 [cited 16 February 2005]. http://www.emedicine.com/ped/topic2706.htm. Louden, Mark. Pediatrics, Bronchiolitis, 21 May 2001 [cited 16 February 2005]. http://www.emedicine.com/emerg/topic365.htm. inflammation of the bronchioles due to a viral infection; children are more often affected than adults. Clinical features of severe bronchiolitis in an infant. From Lissauer and Graham, 2002.
bronchiolitis exudati´va (exudative bronchiolitis) inflammation of the bronchioles with exudation of Curschmann's spirals (coiled mucinous fibrils) and gray, tenacious sputum; often associated with asthma. bronchiolitis fibro´sa obli€´terans chronic bronchiolitis with ingrowth of connective tissue from the wall of the terminal bronchi and occlusion of their lumina; it may be a complication of connective tissue disease or heart-lung transplant, and in children it may follow an acute attack of bronchiolitis or pneumonia. bronchiolitis obli€´terans (obliterative bronchiolitis) bronchiolitis fibrosa obliterans. Inflammation of the bronchioles, often associated with bronchopneumonia. /bron·chi·o·li·tis/ (brong″ke-o-li´tis) inflammation of the bronchioles. an acute viral infection of the lower respiratory tract that occurs primarily in infants less than 12 months of age. It begins as a mild upper respiratory tract infection and over a period of 2 to 3 days develops into more severe respiratory distress. It is characterized by expiratory wheezing, inflammation, and obstruction at the level of the bronchioles. The most common causative agents are the respiratory syncytial viruses (RSVs) and the parainfluenza viruses. Mycoplasma pneumoniae, rhinoviruses, enteroviruses, and measles virus are less common causative agents. Transmission occurs by infection with airborne particles or by contact with infected secretions. The diagnosis consists of evidence of hyperinflation of the lungs through percussion or chest x-ray. observations The condition typically begins as an upper respiratory tract infection with serious nasal discharge and often with low-grade fever. Increasing respiratory distress follows, characterized by tachypnea, tachycardia, intercostal and subcostal retractions, a paroxysmal cough, an expiratory wheeze, and often an elevated temperature. The chest may appear barrel-shaped; x-ray films show hyperinflated lungs and a depressed diaphragm. Respiration becomes more shallow, causing increased alveolar oxygen tension and leading to respiratory acidosis. Complete obstruction and absorption of trapped air may lead to atelectasis and respiratory failure. Blood gas determinations indicate the degree of carbon dioxide retention. interventions Routine treatment includes administering humidity and mist, generally combined with oxygen; ensuring an adequate fluid intake, usually given intravenously because of tachypnea, weakness, and fatigue; suctioning the airways to remove secretions; and promoting rest. Endotracheal intubation is indicated when carbon dioxide retention occurs, when bronchial secretions do not loosen and clear, or when oxygen therapy does not alleviate hypoxia. Such medications as antibiotics, bronchodilators, corticosteroids, cough suppressants, and expectorants are not routinely used. Ribavirin may be used when RSV is the causative agent but is generally used only in the high-risk population. Sedatives are contraindicated because of their suppressant effect on the respiratory tract. The infection typically runs its course in 7 to 10 days, with good prognosis. A major complication is bacterial infection, most commonly after prolonged use of a mist tent. The disorder is often confused with asthma. A family history of allergy, the presence of other allergic manifestations, and improvement with epinephrine injection are usually indicative of asthma, not bronchiolitis. Cystic fibrosis, pertussis, the bronchopneumonias, and foreign body obstruction of the trachea are other disorders that may be confused with bronchiolitis. nursing considerations The focus of nursing care is to promote rest and to conserve the child's energy by reducing anxiety and apprehension; to increase the ease of breathing with humidity and oxygen as needed; to aid in changing position for comfort; and to induce drainage of secretions or to suction when necessary. Fever is usually controlled by the cool atmosphere of the mist tent and by administration of antipyretics as needed. Frequent changing of clothing and bed linen is often necessary in a mist environment to reduce chilling. Vital signs and chest and breath sounds are continuously monitored to detect early signs of respiratory distress. Cough, wheezing, shortness of breath. Supportive, nebulised saline or epinephrine. Acute viral illness common in children younger than 2 years old. Common cause is respiratory syncytial virus; findings include inflammation of the bronchioles, often associated with bronchopneumonia. A development of severe acute BRONCHITIS in which the inflammation spreads to the smaller bronchioles. If this happens the state is indistinguishable from BRONCHOPNEUMONIA. inflammation of the bronchioles; bronchopneumonia. See also chronic obstructive pulmonary disease. acute, mild irritation of the mucosa with excess mucus production, necrosis of epithelial cells, and transient exudation of leukocytes into the lumen. response to necrosis of the lining epithelium at the bronchiolar-alveolar junction and subsequent fibroblastic organization of the fibrin exudation, obliterating the bronchiolar lumen. more severe than catarrhal; a viscid exudate characterized by a predominance of neutrophils, with mucus and sloughed epithelial cells. inflammation characterized by the loss of large areas of epithelium with exposure of the underlying tissue and the development of ulcers.